Temperature-wise the differences aren't all that great, although it was cold in the southern part of the Canadian Arctic Archipelago in 2013, whereas in 2017 the anomaly is all over the Arctic. The real difference is in sea level pressure. January 2013 was dominated by high pressure, which means skies were clear during the long polar night, and so there was a lot of outgoing longwave radiation, with no clouds to bounce some of it back to the surface. And very little snowfall to insulate the ice and slow down the thickening process. There also was a lot of clockwise movement of ice, with leads opening up and refreezing again (remember the huge cracking event we saw later in February 2013?). This atmospheric set-up causes some ice to be transported through Fram Strait, but at the same time the Transpolar Drift Stream pushes the ice towards Greenland and the CAA, where it can then thicken up and turn into the multi-year ice that is keeping the Arctic sea ice pack alive (for now). This year there was none of that, as the opposite happened: Low pressure dominating, brought in by the multiple Atlantic storms that battered the Arctic (the strongest of which I described in a recent blog post). These storms increased precipitation, creating an insulating layer of snow atop the ice. They brought in clouds that bounce the outgoing radiation back down again. And finally, the way the cyclones swirled towards the Kara Sea, meant that the anti-clockwise winds pushed out large amounts of (multi-year) ice through Fram Strait, as well as through the area between Svalbard and Franz Josef Land, into the North Atlantic, where most of it melted immediately. In short, January 2017 was pretty much disastrous for the sea ice. There's just two months of freezing left, and after that we can only pray for a repeat of 2013, the first of two post-2012 rebound years, where clouds and cold temperatures prevented an Arctic sea ice catastrophe. Thanks Neven for the post. One benefit of such drastic changes is that you no longer have any difficulties in reading such charts,as every year is competing to become an outlier. I remember that last year too the FDD chart looked very similar and it felt like 2016 was way off. But, now when compared to 2016-2017, it feels like 2015-2016 was not "abnormal". Meanwhile yet more anomalously warm air is entering the Arctic Basin from both the Pacific and Atlantic sides. Climategate 2 Falls at the First Hurdle? We’ll have much more to say on this controversy in the context of our “Alternative Facts” investigation in due course, but for the moment at least it looks to us as though the nth iteration of “Climategate 2” barely made it out of the starting gate. However Mr. Rose’s loyal army of “rebloggers, retweeters, plagiarisers and other assorted acolytes” and that “Republican-led House science committee” may of course have other ideas? Neven, in the sentence ". So, these are the only two years that didn't see the gap get wider. All the other years did." I think you mean "...Only two years that did see the gap get wider..."
It was a convoluted way of saying that only 2007 and 2016 saw a smaller increase than this year in January (all of them below 3000 km3), and so the gap between 2007+2016 and 2017 didn't get wider. Thanks. I should wait for coffee first.. Excellent as always Neven, thank you. Just wanted to make one comment this time. Even with no Gyre and no sustained Beaufort High, prevailing winds (as indicated by the isobars in your SLP graph) have caused vigorous Transpolar drift from Kara/Laptev toward Fram this January. Literally, huge masses of ice have been transported over the Pole in direction to Fram Strait. Regarding "red line is for January and you'll notice that it's as low as or lower than all the Septembers of the 80's", I think that the spiral graphs show the September 1981 volume to be significantly less than the January 2017 volume. Should be very interesting to see where volume peaks. For how long it tracks in record territory. What the initial descent from peak looks like. This time next month ~ a few days should be very illuminating. So you found one year in the 80's where September volume was less than January volume in 2017. Seriously...Why do you even bother to mention that ? A lot can happen between now and the September minimum. But if that 2,000 km^3 difference between the recent years and this year sustains, then we are going to see a September with half the volume of ice of the recent years. There comes a point where half the volume will be half the extent, which means at this point we are looking at a pretty bleak picture for the coming melting season. Note that in the sentence in the article it states "all the Septembers", which should of course include 1981. The reason that I mentioned it is in case Neven wants to make a change to that sentence. There's absolutely no reason to think that the current 2000 km3 lower ice volume in January will result in only ~2000 km3 lower ice volume in September. I cannot help but think about the difference this will make in terms of absorbed solar energy. With very thin ice at the edge of the pack, much of that should begin melting off as the sun rises, so millions of km2 of additional ocean surface will be absorbing 90+% of the insolation rather than ~20-30%. To make matters worse, large surface areas that are usually ice-covered will be far enough removed from the smaller edge of the ice pack that the absorbed energy could significantly warm the surface temperature rather than being mostly absorbed by phase change of nearby ice. Every ~1 C of surface temp warming will increase the vapor pressure of H2O by ~5%. So there are two strong feedback/amplification effects that will be occurring in any area of the arctic that melts off early, and that amplification will last the entire summer. I think it will take some extraordinary good luck with weather in order to only see September minimums remain 2000 km3 below recent norms. I know from lurking here for many years you know all this... So I just want to understand what I'm missing. What is your reasoning for what I see as incredible optimism in your comment, when you seem to speculate on September minimums being halved as a severe potential negative? It seems to me that would be about as good as we could hope for. Glenn, I assume Rob is just looking at the numbers. The most we've ever lost from Jan 31 to minimum is 14.8 kkm^3 (2012) and in recent years the least is 12.1 kkm^3 (2014). In 2016 we lost 14.1 kkm^3. The long-term trend is increasing, but only by 0.05 Mkm^3 per year. The difference lies not in how much we melt so much as it is where we start from. So the fact we're as low as we are pretty much dictates we'll be low in September, but how low depends on the next few months of weather. If we lose the max we've seen in the last decade we'll drop to 1.4 kkm^3. OTOH, if we lose the minimum we've seen over that same period we'll still be at 4.1 kkm^3 and not pass 2012's low record. If we lose the average we've seen over the past decade we'll finish at 2.6 kkm*2. Thank you for the analysis, Kevin. Based on those numbers, if I was to guesstimate, I'd say around 2000 km3, halfway between the average and max loss from this date. I'd predict more than average loss since refreezing conditions still look poor now and export high, plus having less ice to start with translates to greater vulnerability later. I wouldn't predict more than max loss, however, because the max loss must surely have been set in 2012, when melting conditions were exceptional. Thanks Kevin, yes, I could not have said it better myself. And let me add that the worst-case scenario (1.4 kkm^3 left over in September) is VERY scary. And Glenn, you are right that there is albedo amplification in the numbers, but that albedo amplification is also there in all the other years. So it is kind of in the numbers already. But it does put my mind a little more at ease. Though I lack the sophisticated knowledge of the cryosphere to imagine exactly what that would entail... I know more than enough physics and enough about the Greenland Ice Sheet for that alone to scare the crap out of me. It's like watching a tsunami approach in slow motion. What is the impact of 1400 km^3 left over in September ? For starters, this would be about 1/3rd the amount of ice of the lowest September ever recorded (2012). 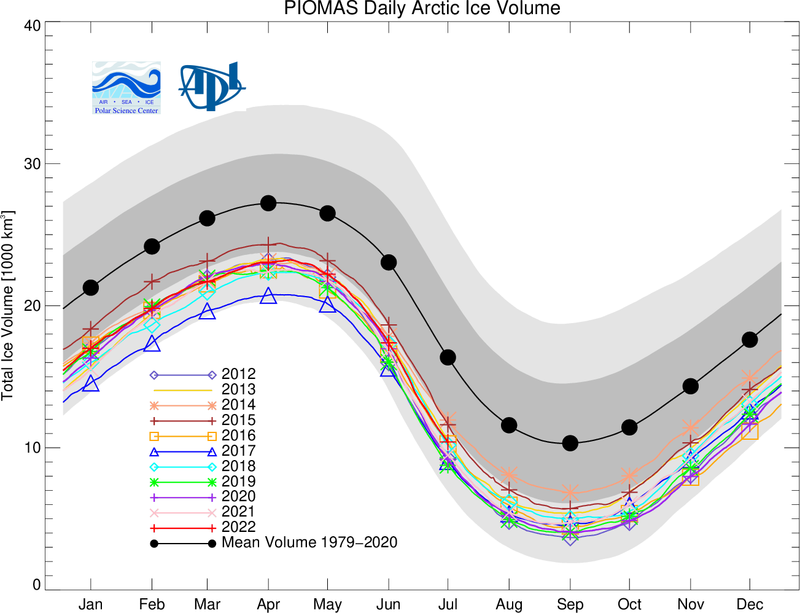 So far, ice extent has been going down slower than ice volume, but, as I mentioned before, there comes a point where volume decrease and ice extent decrease will align, and thus if this volume projection would materialize, we would be looking at 1/3rd the ice extent of the record minimum. And you are right, once extent starts to drop quicker, the albedo amplification will be stronger too. That is why I said "kind of" when referring to albedo amplification already being in the volume numbers from the past years. Once volume starts to drop to near zero, all kind of stuff will change. And Prof. Wadhams may turn out to be right that at some point one summer, "it will just melt away quite quickly". A massive storm is swirling toward Europe. It’s a weather maker in itself, churning up waves as high as 46 feet and pressure dropping as low as is typical for a Category 4 hurricane as of Monday. The storm is to the southeast of Greenland and its massive comma shape has made for stunning satellite imagery. The storm is expected to weaken as it approaches Europe, but it will conspire with a high pressure system over the continent to send a stream of warm air into the Arctic through the Greenland Sea. It’s just the latest signal that the Arctic is in the middle of a profound change. Sea ice extent has dropped precipitously as has the amount of old ice, which is less prone to breakup. Beyond sea ice, Greenland’s ice sheet is also melting away and pushing sea levels higher, large fires are much more common and intense in boreal forests and other ecosystem changes are causing the earth to hyperventilate. "how carbon pollution is reshaping the planet and scientists are racing to understand what comes next." Pretty much what is happening now, a continuous injection of heat into the Arctic Ocean area. There is no stopping of this unless the coldest air zones shrink further. Which is hard to imagine, they are further South, smaller and bend the jet stream towards the North Pole on Pacific and Atlantic Eastern side. Right now there are 2 Polar vortices split by the Arctic Ocean air being largely warmer, this other yet again coming large Cyclone continues the process. The current Arctic Atmosphere is warmer than last year, this big coming cyclone can only make things crazier. Thank you SOOOOOOOO much for keeping us deep & shallow lurkers informed. The state of the Arctic Ice now continues to remind me of what I called "The Belmont Lake Effect" in a past post of mine. Big wind + weak ice = not so nice outcome for the Arctic. It's anecdotal and intuitive (certainly not rigorous science) but the regulars here seem to support it with their number crunching. *sigh* I wish my crystal ball wasn't in the shop for repairs because it's looking like we may have a wild ride this melting season. Thank you again for all you continue to do. It's highly appreciated for sure. "And Prof. Wadhams may turn out to be right that at some point one summer, "it will just melt away quite quickly"." Interesting how what may have seemed outrageous to some just a few years ago seems much more plausible now. I remember suggesting just a few years back on this site that CO2 PPM may soon reach an annual increase of 3 ppm. I was told by someone on here, and I'm paraphrasing, "No, PPM annual increase has been averaging about 2. Don't make it something it isn't." But in 2015 the increase was 3.05 ppm. "The annual growth rate of atmospheric carbon dioxide measured at NOAA’s Mauna Loa Observatory in Hawaii jumped by 3.05 parts per million during 2015, the largest year-to-year increase in 56 years of research." "During 2016, the annual rate of atmospheric carbon dioxide increase will have hit a record 3.2 to 3.55 parts per million (ppm)." As those of us that follow this topic know, all that has to happen is to hit a certain threshold, a tipping point for things to begin changing fast. That seems to be the case at both poles and the speed of change is alarming, i.e. unless the trend subsides. With a very unusual jet stream segment Northwards North Polewards from Nares Strait! Reminds me of beautiful mysterious Egypt, when their desert was greener, then their population migrated towards the Nile. This suggests a much colder climate approximately 10 to 3.5 thousand years ago with regular huge CTNP's veering the Atlantic Moisture further East, as opposed to Northwards now, when the Savana was near the Mediterranean. The climate wasn't warmer 3.5 thousand years ago, rather the reverse. The orbit of the Earth was slightly different. This slightly changed storm tracks, and feedback with greener/wetter/less dusty land getting more rain making the difference. Once the land starts to brown, the rain reduces making more for more dust, warmer surface and less rain. The Sahara has greened and returned to a desert multiple times. @ Hans "... For 2016 I don't have official numbers yet - maybe someone else has that link ..."
I'm not sure what holding up the release of global numbers from NOAA's ESRL, as they are still stuck at October. However, the Scripps Institution has monthlies for MLO right up to Jan 2017. Jan 2016 - Jan 2017 had a 3.4 ppm(v) increase. Hans, I always agreed with Prof Wadhams description that the Arctic sea ice"... will just melt away quite quickly ..."
I also always thought his timescales were way out - although not by as much as I once did. There was an interesting period, about 3500 years ago when there was some cooling from the larger trend of warming since 10,000 years ago, but my inference was warming since last glacial. Of when the Arctic was much colder than today, evidence of humans in the Arctic apparently started about 5000 years BP. And yes it was wetter in the Sahara then, as written. "Jan 2016 - Jan 2017 had a 3.4 ppm(v) increase." NOAA has issued a preliminary growth rate for 2016 at 2,77 ppm. At the web-site you can see NOAA's special way of calculation the growth rate. It is the growth in the average for the 4 months around 1. jan (that is nov, dec, jan, feb) to the same 4 months in the next year. I would say that the growth rate from 2014 to 2015 is 2,18 ppm (and not 3,05), and growth from 2015 to 2016 is 3,38 ppm (and not 2,77). "I also always thought his timescales were way out - although not by as much as I once did." Exactly my sentiments, Bill, as it was more the timeline I was referring to which a lot of people labeled unnecessarily alarmist. Now a blue ocean event doesn't seem so far off. "To me it is a slightly odd way to calculate growth rate." "I would say that the growth rate from 2014 to 2015 is 2,18 ppm (and not 3,05), and growth from 2015 to 2016 is 3,38 ppm (and not 2,77)." Ok, so different ways of calculating it but annual growth rate (NOAA, MLO), also comes up with a 3+ for one of those years. 3.38 ppm is a huge jump from just a few years ago. Now that there have been incidents of larger CO2 increases per annum and three years running of global temperature record high temperature, the big Q is will this trend continue or is it anomalous due to the El Nino event? Maybe 2017 will need to be in the books to know for sure. The last section of the post estimates a global CO2 growth rate between 3.49 to 3.63 ppm for 2016, depending on methodology. "La Niña is over. It only lasted a few months, but tropical warmth is taking over again. While the Pacific will probably hover in the neutral territory between La Niña and El Niño into the summer, some models are hinting El Niño could return as early as this summer." Well, no sooner is the question asked that it gets an answer, maybe one we didn't want. Return of El Nino so fast?! Very interesting article, A4R. 2016 really was an outlier year or worse case, a harbinger of PPM increases to come. The Arctic season for cloud free atmosphere should be in full bloom now, but it isn't, the big test would be to observe a deeper cloud cover when albedo should be .5 , half cloud cover turning to deep summer like cloud cover, albedo .8 . Trending El-Nino would absolutely guaranty 2017 smallest minima ever, but as we have shown lately, having a great cloud cover during Arctic spring and summer is a good thing for sea ice. We remember LaNina trending while there was a great Arctic 'big blue' sky event last spring, causing an earlier melt and severe ice damage despite cloudier summer. A cloudier winter in part from trending El-Nino may be seen as a means to confirm the models. 2017 is the first year for volume to be outside of 2 standard deviations according to the first graphic. "global markets will panic if 2018 repeats the below 2 stand deviation trick for PIOMAS"
If they had any understanding of those implications near term as it may affect the global economy's opportunity to generate growth and profit, but they've done a good job so far of ignoring this type of information. However, some day of course they will be forced to grasp what is going on due to events far beyond people's ability to ignore. "However, some day of course they will be forced to grasp what is going on due to events far beyond people's ability to ignore." Love it. The death of cognitive dissonance will likely be quite harsh for some folks. Not to sound bleak here... but I think the more earth is facing climate change, resulting in more famines, more economic depression, weakened/collapsed governmental institutions, mass human migration and more war the less those affected are likely to diver resources to environmental causes.... call it a negative feedback loop. The irony of the issue that if the climate gets bad enough for minds at WUWT to change it will be to late for anyone to do anything about it, the only silver lining that maybe lessons will be learned by those that rebuild. And don't forget the Easter Islanders, who at some point, in full cognizance of what they were doing, cut down the last tree on their island. It is now believed that the island was divided into competing clans, who wanted to outdo rival clans in the construction of the giant heads, and trees were needed as rollers to move the stones. These groups of people consciously chose the destruction of their environment, and themselves, over the reining in of their appetite for resources, and the flaunting of their wealth. How is neo-liberal free-market capitalism any different? Arguably we are seeing somewhat a departure from the neo-liberal free-market capitalism theology... into I don't even know what... pre WWII full blown crony capitalism, with nationalistic and fascist overtones? Just makes you want to beat people over the head with a copy of Jared Diamond's Collapse until something sinks in)). Egh, back to the arctic sea ice... is it too early to call the max? We do have examples of humans adapting after they radically change the environment in the case of Australia and the Americas. Possibly also in other locales. And probably in those instances (where megafauna were driven to extinction), it was caused by a combination of human hubris and climate change. I wish you would refrain from using the language that the usual subjects have been promoting all this time as part of their propaganda campaign. A "free market" means one in which buyers and sellers have approximately equal market power, resulting in competition, and in which all costs are internalized (included in the transaction and not distributed over the society). It is the result of policies (specifically, strong government intervention to prevent anti-competitive practices), not a policy. Laissez-faire capitalism, which is what they are promoting, is a policy, which destroys free markets. I know, it may sound like nitpicking, but this is a propaganda war, and you can't just keep surrendering on every front. They've been rolling us up for decades, and it's time to take a stand. In a real free market, everyone would be driving electric cars charged by solar panels on their roofs. Piomas may be overpredicting thickness in that elongated region near the Pole, but I wonder if it is Cryosat that overestimates thickness in central CAB and Greenland sea, because there is more snow cover and ridged ice. Wayne, here's is another article on Arctic weather. "Love it. The death of cognitive dissonance will likely be quite harsh for some folks." Yes, got to love that moment, John, and even though it will be harsh on all of us, their final awareness will be quite a moment like breaking through to light after many years of boring a tunnel through several miles of dense granite. As appealing as they may seem, these tenets are based on logical fallacies or misinterpretations of history..."
There is the erroneous belief today that markets are sacred and can do no wrong. 'Market failure can never happen and only the 'purest' form of capitalism can succeed. Sadly this belief will lead to catastrophe in time. A good book to read is 'The Collapse of Western Civilization ' - A View From the Future' by Naomi Oreskes and Eric Conway (2014) A great little book- that in fact now has become all the more plausible. Yes, of course, we are using the term differently-- that's my point. You have been conditioned by right-wing propaganda; it works the same way as with climate change: They co-opt the language and (often) reverse the meaning. You know the term "doublespeak"? Let me pose a question then. What term would you use for what I described? ...one in which buyers and sellers have approximately equal market power, resulting in competition, and in which all costs are internalized (included in the transaction and not distributed over the society). Also, would you disagree with my last sentence? I repeat that a free market is the result of strong government regulation, and yes, it works to solve problems. The right-wing has successfully created a false dichotomy, as it has on the climate issue, which will continue if you accept its language and framing. Okay, I think I see where you are coming from. What the Huffpost article describes could more correctly be called laissez-faire capitalism, which calls for total deregulation and no government intervention in markets. "In Third Millennium Capitalism (2000), Wyatt M. Rogers, Jr. notes a trend whereby recently "conservative politicians and economists have chosen the term 'free-market capitalism' in lieu of laissez-faire""
Is this the kind of thing you're referring to when you say that the right-wing has co-opted the term 'free-market', and reversed its meaning? But I suppose one could argue that laissez-faire capitalism does itself call for free-markets, but in the special sense of being free of government regulations. But I think you are using the term 'free-market' in a Keynesian sense. Keynes' central tenet is that government intervention can stabilize the economy. Keynes thought that free-markets had no self-balancing mechanisms, and therefore required regulation by the government. So Keynes takes a diametrically opposed view to the nature of free markets than the laissez-faire camp, who think a free market will always self-regulate naturally, like an organic eco-system. Both camps seem to use the concept of a free market, but in different ways, which makes discussion difficult. I think your point is that the right-wing laissez-faire types are trying to cast aspersions on the Keynesian idea of government-regulated free-markets, by assigning to it all of the terribly destructive outcomes of laissez-faire capitalism itself, in a kind of switch-and-bait sleight-of-hand trick to hoodwink the populace into accepting even more corporate-friendly legislation. Perhaps you are right. But is there any such thing as a free market anyway, in the sense you describe of equally empowered buyers and sellers? I think it is an ideal, but not a reality. Advertising by corporations skews what a buyer thinks he needs or wants, for instance,thereby altering that balance of power, and corporate lobbying of governments perverts government-imposed regulations so that they benefit corporations, not society,and all at the expense of our environment. So when you advocate for a free-market as you define it, can you point to a place and time where that actually existed, and to which we might return, or is it an ideal in the Platonic sense, to be striven for but never achieved? Either way, you have succeeded in convincing me to use the term 'laissez-faire capitalism' instead of 'free-market capitalism' from now on, as it does seem to avoid the pitfall you mentioned. Apologies to Neven for straying so far off topic. Back to lurking now. Wayne, fascinating, great link. Here's some interesting verbiage from under one of the pics. "This is likely the first time when sea ice is so broken, fluid, and warm, really by the warmest winter in Arctic Ocean History. Sea ice is like a graph, it records the cumulative temperature of winter by exhibiting how "white" the ice shows on infrared Imagery, the only brilliant white here is on top of Greenland or very high clouds. Near Pole temperatures are easily 15 to +20 C above normal. The intense black is set to -10 C or warmer." I and others, like Neven, miss the time when there was a long break due to Arctic night, this non stop action is not what we want to have happen. But when totally more than 30 years of observing never seen event occurs, there is no choice but to report it. We are not leaving any chance for an excuse by any person to claim ignorance about the subject. I don't want it to happen either, Wayne. My enthusiasm is about the situation and how fast it's changing. "Physicist Steven Desch has come up with a novel solution to the problems that now beset the Arctic. He and a team of colleagues from Arizona State University want to replenish the region’s shrinking sea ice – by building 10 million wind-powered pumps over the Arctic ice cap. In winter, these would be used to pump water to the surface of the ice where it would freeze, thickening the cap. The pumps could add an extra metre of sea ice to the Arctic’s current layer, Desch argues. The current cap rarely exceeds 2-3 metres in thickness and is being eroded constantly as the planet succumbs to climate change." Let me define that better: Enthusiasm for the sheer fantastic nature of what is happening scientifically, rather than the worldwide potential consequences that may occur. I'm leaving for a trip, so won't be available for responses, but have fun folks while I add more carbon. I too appreciate Neven's tolerance so I will answer as briefly as possible. Of course I am delighted to hear that you will "spread the word". After a couple of decades of this, in the last two weeks I've had my first two converts! 1. Smith v Keynes. Smith has been variously interpreted of course, but he clearly recognized that markets would fail through monopoly, collusion, what we today call regulatory capture, and overall concentration of wealth. 2. The point of the Right's propaganda is to create the illusion that the only choices are laissez-faire or Soviet-style command economies. And, to hide the fact that laissez-faire leads to exactly the same kind of top-down control, in a Fascist/Feudalist model. 3. Actual free markets are everywhere. You have to realize that there is no such thing as an "overall" free market, rather, there may or may not be a free market for a specific "product" class. For example, I just saw an article about people lining up for 11 hours to buy a particular craft beer. Certainly, there are sufficient buyers and sellers in that market to create competition. And this is the case in many areas; it isn't even really necessary for there to be lots of sellers, as long as there is actual competition. But, unfortunately, we also have plenty of oligopolies and regulatory capture and so on. Particularly so in the areas we here are concerned about, like the market for energy, which is severely distorted. 4. Of course, the issue of externalized costs operates in parallel to everything. On this I think we need to be careful and nuanced in our own framing. In the current political climate, better to emphasize the market aspect (true costs of FF or sugary drinks) rather than making judgments about people's judgment. Anyway, thanks again for the positive (and informed and rational, which is rare,) response. Posting from the airport, but hopefully will go through. Agreed Robert, it is an absurd idea from a practical standpoint. Just shows that desperation is setting in. James, I understood from High School that one of the assumptions of free-market theory was the free flow of information i.e. the consumer was able to make a perfectly informed choice. Thus, the whole idea falls from there- especially when it comes to petrol going up and down every day. Thanks for all that: I learnt a lot from the both of you reading those comments. Forget about 10 million devices in the Arctic. I'd be VERY happy if we could have just 1000 buoys working in the Arctic measuring the changes that are happening. Right now, there are only a few dozen buoys in the Arctic, and only one with a camera (obuoy14; oops, that one died in November), and one or two that measure below the ice (ITP98). Antarctic sea ice hits lowest minimum extent on record. I'd be surprised if this is the start of a new trend, as Antarctic sea ice is a pretty volatile measure, and this seems to have to do with ENSO. But if it is a new trend, that won't be good. Most are familiar with that link, showing info. on CO2 ppm increases. On a day vs. day comparison, Feb. 11, 2016 vs. 2017 is a +3.5, and for a month to month comparison, Jan. of 2016 vs. 2017 is +3.43. What is intriguing about that last comparison is a lot of the CO2 ppm increase of late had been blamed on El Nino, but it already switched into La Nina and recent reports indicate it is waning, so why is there a big shift into much higher ppm increases? The CO2 increase over the previous 12 months is still boosted by El Nino and will only get back to a more normal level of annual increase when the northern growing season kicks, so that is from May onward. I have been plotting out the annual rise 2015-17 against the rise back in 1997-99 - see here (usually 2 clicks to 'download your attachment') - and there is nothing so far to suggest that the annual CO2 rise will not settle down to 2.25ppm or so, as it was pre-El Nino. @ Neven "Antarctic extent at record low"
As Neven said, the NSIDC daily figures hit new heights - sorry, plumbed new depths - with the release of data for the 12th Feb.
@ Al "... nothing so far to suggest that the annual CO2 rise will not settle down to 2.25ppm or so ..."
I really hope that proves to be the case. However, I worry about all those coal-powered stations that have come on-line in China and India, and also worry about how long the land/sea sinks are going to continue mopping up ~ 55% of emissions. @Hans "Anyone with a link or theory would be..."
Last October Alex Smith over at Radio Ecoshock interviewed Dr. James Curran, formerly the head of the Scottish Environmental Protection Agency. In a nutshell, Curran claims that plants reached the peak of their ability to absorb CO2 in 2006, well ahead of the 2075 estimate of the IPCC, and have been absorbing less ever since, for various reasons (outlined below). Alex writes that Curran "has published new science that shakes our planning for climate change to the core. The plants it seems are soaking up less and less of the carbon dioxide we pump into the sky. Peak carbon is not later in this century, as predicted, but behind us. It’s stunning news that makes climate action so much more urgent than you’ve been told." "Most of the land on Earth is in the Northern Hemisphere. What if all the plants there started to capture less and less carbon dioxide from the atmosphere? Surely that couldn’t happen. "James Curran is co-author of a new study published in the journal “Weather” on September 1, 2016. The title is: “An estimate of the climate change significance of the decline in the Northern Hemisphere’s uptake of carbon dioxide in biomass.” It’s not good news. Here’s the big worry. The IPCC (Intergovernmental Panel on Climate Change) calculated that around 2075, the plant world would start to take up less and less carbon. Maybe we’d see the start of that process by 2035? Meanwhile, the idea of plants as a sink which will thrive with more CO2 and warmth is built into every carbon budget ever released. The catch is: actual measurements of CO2 at Maunu Loa show that tipping point is already in the rear view mirror. It happened in 2006, Curran tells us, and he explains how we know that. WHY ARE PLANTS SOAKING UP LESS CO2? Rapidly increasing temperatures, to which plants cannot accommodate themselves quickly enough (after all trees can’t uproot and move polewards to keep cool), may mean they’re just not growing as well, as fast or as healthily as they used to. Remember that this is on average – across all plant species across the whole of the N. hemisphere. Increasing spells of drought in certain parts of the world (the USA has suffered lengthy droughts, as has the Middle East and the Amazon rainforest, for example) could be seriously damaging both natural vegetation and human crops in their ability to thrive and absorb carbon from the atmosphere. Extreme wind events, predicted under climate change, could be resulting in significant forest damage through wind-throw and imposing another negative impact. Wildfires, on an extensive scale including Indonesia, Russia, Alaska, and mainland USA, could be destroying vegetative cover and, as you rightly say, also burning the soils which store large amounts of carbon. This process turns naturally sequestering ecosystems into huge emitters of carbon dioxide. Drought, as I mentioned, could also be turning peat deposits into carbon emitters rather than carbon absorbers due to drying out, cracking, losing structural cohesion, collapse and either direct oxidation into CO2 or erosion, in later heavy rainfall events, and washing out into rivers – which are certainly exhibiting rising dissolved organic carbon levels in many parts of the world. There seem to be many Scottish examples of this, sadly. On the other extreme, flooding can kill off vegetation and crops by root saturation. Or it can wash out soils, and wash out vegetation itself. Thanks for the very interesting and unfortunate information, James. Reduction in the ability of carbon sinks for a multitude of climate change reasons and increases in natural CO2 emissions due to various reasons explained in the link and your post. Got to love those conservative predictions regarding capability of plants to absorb ever more CO2 into the distant future that never panned out. The bit that galls me is the mainstream idea there are X number of billions of tons of CO2 we can still spew into the atmosphere this side of 2C. They call is our carbon allowance which I'm sure we cannot afford. Comparing the annual rise and fall at Mauna Loa suggests that the annual absorption of CO2 has been trending just below 6 ppm/pa since 1990 while the annual emissions, natural and man made, have been steadily increasing. Overall absorption has increased from 5 to 6 ppm/pa while emissions have gone from 6 ppm to 8.25 ppm. There was a substantial increase in absorbtion in 1991 and 1992 which has some impact by flattening the trend line. However there certainly does appear a distinct leveling out of absorption over the past 20 years. This is probably not sufficient time to provide a definitive trend but certainly bears watching. "...since 1990 while the annual emissions, natural and man made, have been steadily increasing. Overall absorption has increased from 5 to 6 ppm/pa while emissions have gone from 6 ppm to 8.25 ppm." However, it's been just in the past couple of years there has been a substantial increase in CO2 ppm increase. Your referring to increases in emissions since the 1990's. So the question remains what would cause such a big difference that quickly? ..the feedback of temperature itself! There have been three straight years of record breaking quite sizable global avg. temperature increases and that fits with the timeline of CO2 ppm dramatic increase. Good call, AJT. Any prognosis if these feedbacks are now self reinforcing to the point of continuing to rise or is there an argument for what occurred being temporary? There was an interesting piece of work published last year by Julienne Stroeve (University College London/NSIDC) and Dirk Notz (Max Plank Institute for Meteorology). They propose/imply/suggest that there is a near-linear relationship between atmospheric CO2 levels and the smoothed long-term decline in Arctic Sea Ice levels. They postulate that the emission of another 1,000 gigatonnes of CO2 will result in ice-free conditions in September. "Self reinforcing" means to me positive feedback with a loop gain greater than 1. Nyquist stability criterion. This is ignoring methane, other factors. Double CO2 or 260ppm means about 2C to 5C warming. Yea, should use log of CO2, which would show less loop gain. But I want to do the math in my head and check with a calculator...Can not use Nyquist for non-linear. CO2 went up more than expected by a couple of ppm. So go around the loop. Increase in CO2 causes a temperature increase causes an increase in CO2. Note that this is overestimated a bunch... But the answer is clearly well less than 1. If the CO2 increase was more than 6ppm per year higher than expected, would need to look closer. The science is out of kilter with reality, unless there is a printing error in the article. ...more realistic but still optimistic. "At present emission rates of around 10 gigatonnes of carbon each year, that equates to about September 2043." ...the maths seems awry here. Did you mean fossil fuel emissions of ~ 10 GT pa and ~ 40 Gt of CO2? Bill's post involved two different units: GT-C, and GT-CO2. He quoted a source saying that "another 1000 GT-CO2 would lead to ice-free arctic in Sept". And then he went on to note that our current emissions are ~10 GT-C.
10 GT-C is 36.7 GT-CO2. (also, these numbers are likely "GT-CO2e", meaning that the total global warming potential of all emissions would equal the equivalent of X GT-CO2. When people shorten that to GT-C, they take the unit of GT-CO2e and divide by 3.666666666). That said. I think we'll see a blue ocean at 90 degrees N for a few hours of this year... though it may be several years before that becomes the norm. 2043 was a fantasy of yesteryear. We've crossed a tipping point, and this is worse than projected. @ D-Penguin "... the maths seems awry here ..."
Does the maths still seem awry? "... (I think it will be considerably earlier.)" Increasing CO2 may also be coming from forest fires that are increasing across the arctic and in other areas. A 30,000 ha (75,000 acres) fire in Australia can generate 1 million tonnes of CO2. period, wildfires burned approximately 1.3 million. (EPA, 2016a). This is just in Alaska, it does not cover Canada or Siberia where we have seen significant fire activity over the past few years. I doubt that Arctic forests regenerate at the speed of Australian forests to reabsorb the CO2. They say the Australian bush is burning so hot these days it inhibits natural regrowth. Sorry, your comment obviously popped up as I was typing my earlier response, and I was then heading straight off to bed. Any allowance for equivalents is over and above this conversion factor. As regards extensive totally clear water at 90N, that's only a matter of time. The Chinese ice-breaker, Xue Long (i.e. Snow Dragon), had a pop at going from the Barentz to the Bering via 90N in 2012, but came up short. I'll be surprised if one of the Russian breakers (either from Rosatomflot or the Navy) don't have a go during 2017. I would be shocked if the residual ice left at 90 degrees N in September would be a challenge for the average breaker. I expect a few hours of blue water... If so, it's no longer a question of "if" a breaker tests that passage, it's "how early". But with respect to global emissions. I thought (I could be wrong here, obviously) that when they said "36 GT-CO2", they meant "36 GT-CO2e". I thought that number included tens of millions of tons of methane and hundreds of millions of tons of NOx and tens of thousands of tons of CFC's and other refrigerants and industrial solvents and hundreds of thousands of tons of carbon black... etc.. I thought in terms of actual CO2, we were only emitting ~20-25 GT/year. The "tons CO2e" was simply an easier way to digest the information... and the media just simplified it further to "tons CO2". I haven't really looked into it, it's been my general understanding of how the numbers are read for as long as I can remember. But if I'm wrong in this, than in my attempts to reconcile and grasp the scope of the issue, I've been low-balling the scope of the issue considerably. (!!!! ), and I'm pretty horrified by the scope of the issue now. Curious. You appear to ignore that sea ice has an opposite role during the summer than during the winter. Sea ice acts as an insulator. During the Arctic winter sea ice prevents heat loss by the ocean, while during the Arctic summer sea ice prevents heat gain by the ocean. The relevant metric is Arctic sea ice extent during the melting season. Using an annual average shows a poor understanding of Arctic climate issues and is done to advance unjustified alarmism. And some of the other points made in that subthread by the same author (Javier) at Climate Etc. I think you have to flesh out what the points are, or invite Javier to articulate them here himself. The relevant metric is Arctic sea ice extent during the melting season. But the status of the icepack during the winter and early spring should have a pretty big impact on the average sea ice area that is seen over the course of the melting season. Your denialist is trying to pretend that the two metrics: status of the icepack during the winter and status of the icepack during the summer; can be treated as entirely separate cases, which is absurd. If we're down ~2000 km3 now, it's hard to imagine how we'll not see a significantly lower area as this much smaller volume of ice melts away during the melting season. I had meant to say "your denialist is partly right".. I'm trying to maintain discipline and not give the denialist nonsense-engines any other label than "denialist". A skeptic is one who demands evidence before believing... the idiots railing against climate change are people who reject and ignore evidence in order to cling to denial against any and all facts and logic. As I've said several times, annual averages are a useful part of the puzzle, but they're not the entire puzzle. Just last year we've seen how certain information sometimes won't be conveyed by an annual average of extent. Extent was in record low territory for most of the year, and thus the annual average was low as well. One would assume that this meant that the minimum record was smashed to pieces, except it wasn't, because June, July an August were mostly cloudy, and so the extent decrease slowed down considerably and the 2016 melting season came in 2nd/3rd (depending on which data set you use). Now, that's the kind of information the annual average won't convey, and so you need to look at other sources of information as well. It's like measuring your weight every day from Jan 1st to Dec 31st. You're really overweight at the start of the year, then you stop eating for half a year and you get really thin and undernourished, followed by a junkfood binge after which you're overweight again. But then you take the average of all those daily weighings, and presto, your average weight is perfect! But, one might ask, how's your health? As far as that 'Javier' is concerned: I've discussed with him over at Paul Homewood's blog. You can get quite a long way with him, further than most climate risk deniers, but you lose him when the time comes to draw conclusions (that's when the dissonance takes over). There's not much to learn over on Climate etc., especially about Arctic sea ice. All Judith Curry cares about, is disinforming people and somehow get paid/attention for it. The impression I got is that trying to have a convo with Javier, in particular at Judy's crib, would be completely useless. So inviting him here is not something I'm inclined to do. And learning from him over there would be likewise a waste of time. My interest was to advance my own understanding and I think the best way to do that was to ask for some other input to some of the points he raised that I thought were interesting. Why do you say that...given that it seems that measurement of area is prone to error? So would it be fair to say that neither annual average nor summer minimum are, in themselves inherently more useful if they aren't viewed within the extenuating context? Both can convey meaningful information relative to long-term trends? I actually like reading dumb science comments as a means to correct, not the person who writes erroneously who is by all standards a legend in his/her own mind of scientific prowess, but for the persons who seek whether or not the said author is right. "Curious. You appear to ignore that sea ice has an opposite role during the summer than during the winter. Sea ice acts as an insulator. During the Arctic winter sea ice prevents heat loss by the ocean, while during the Arctic summer sea ice prevents heat gain by the ocean." It is scientifically known 30 cm sea ice looses 129 W/m2, that is a huge number, for instance we talk about 2 X pre industrial CO2 keeping 4 W/m2 from escaping to space. Not much of an insulator isn't it? Although open water can loose more than 400 w/m2, depending on winds. the sun input given a cloudless day at that latitude is 164 W/m2. Meaning, at Local Apparent Noon, the ice would be melting. So much for the comfort in knowing that sea ice insulation is a great thing assuring people to consider the nonsense of being worried about extent. "The relevant metric is Arctic sea ice extent during the melting season. Using an annual average shows a poor understanding of Arctic climate issues and is done to advance unjustified alarmism." Since a yearly daily average brings that out, amongst other things. Look at todays bottom picture. Thin sea ice with open water contribute to the lessening in sea ice volume. Yes, I would say that's fair. Of course, the summer minimum is most easily grasped by people, and can be illustrated with a satellite image. As for extent vs area: Area is 'better' most of the time, except when there are a lot of melt ponds. Especially now that the ice pack consists of smaller, thinner floes, that easily get pushed around by winds, causing the ice pack to disperse more than it used to. These holes in the ice pack are counted for area, but not for extent. But again, every source information is useful, as there are a lot of things we don't know. To some people that's a comfort, but to not have enough information when things are obviously changing so fast and on such a large scale, is the exact opposite of comfort, IMO. What's still not clear to me is what question you are trying to answer when you talk about "meaningful information". That's why I asked for a little more context about the original discussion. Are you talking about the rate at which sea ice may disappear, or are you talking about the effects on overall climate of the sea ice disappearing, or what? There's a lot of information to be had; Wayne offers some underlying physics to begin to compare "winter" v "summer", but it would help to be able to focus better on what you are looking for. Consider the case whereby a satellite is giving measurements based on a 25x25 km grid. Consider also that there are 6 chunks of ice floating about, and that each of these were 100 sq kms in size. The total area in which the albedo is in the order of ~ 0.8 would therefore be 600 sq kms. That holds true irrespective of the position of these ice chunks relative to each other. If the 6 chunks were jammed together into one grid square, the area would register as 600 sq kms, and the extent as 625 sq kms. However, if these chunks were dispersed, whilst the area would remain unchanged, the extent could now register as 6 x 625 = 3,750 sq kms. However, as others have indicated, there is a problem with area as the metric during summer months, due to the difficulty distinguishing between open water and melt ponds. We have to make the best of the various metrics available - at all times bearing in mind any limitations or biases. On the subject of annualised metrics versus daily or monthly equivalents, there is again a trade-off. As Neven correctly pointed out, in any annual metric, detail gets lost. On the other hand, very short-term metrics are prone to egregious cherry-picking, owing to the intrinsic "noise" within the data. Using the NSIDC monthly data for extent, 1989 had an average annual extent of ~ 12.23 million sq kms, and 2013 had an equivalent value of ~ 11.15 million sq kms. That, I would argue, is a meaningful difference. However, April 1989 saw a monthly extent of ~ 14.53 million sq kms versus ~ 14.44 in the same month of 2013. Nowhere near as big a difference. It gets worse when one looks at a shorter time frame. In fact, in May 2013, Neven allowed me to put up a guest post describing how deniers cherry-pick in response to such meaningless noise. Bill's reply correctly interpreted the intent of my comment. I would only add that the uncertainty of the area estimate is not as problematic - in terms of considering amplification effects - as is assumed. Melt ponds also have significantly lower albedo than ice or snow-covered ice, which is why the satellites sometimes get confused and assume melt ponds are open water. If the concern is amplification, the overall error in area estimates probably serves to present a more accurate representation of the amplification concern. Everything is an estimate, everything carries some degree of uncertainty... but we know that a world in which there is 2,000,000 km2 less area covered by ice in the arctic would result in far more heat absorption by the arctic ocean, which would impact the amount of heat flowing around the base of the Greenland Ice Sheet... If the actual fact of the matter is that there is merely 1.8 million km2 less area of ice and an additional 0.2 million km2 of melt ponds, the total amount of additional energy injected into the arctic water will be similar, and it will still be terrifying.